A tale of three Nightingales. 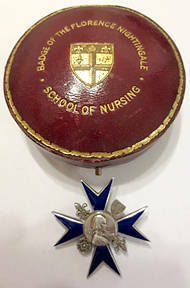 Nurses who trained at St Thomas's Hospital London are often known as Nightingales, as is their training school badge, which is considered one of the most iconic nursing badges to have been designed and issued to nurses upon qualification. It is a beautiful piece of craftsmanship and when presented in red leather box, is set off beautifully. 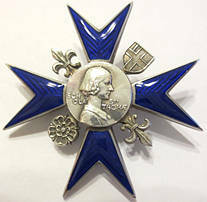 The badge was designed by Dame Alicia Lloyd Still, in 1925, when she was Matron of St Thomas' hospital, with the relief of Florence Nightingale, the founder of the first Nurse training school, at St Thomas' Hospital in 1860, on the front. 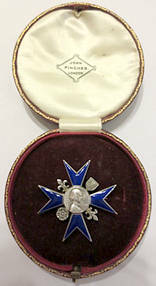 Consequently, a Nightingale badge is much sought after among nursing badge collectors; generally the badges are named, some marked for "loyalty," others simply with the owners name on the back and dates of training, but very occasionally, a badge appears which has not been named. 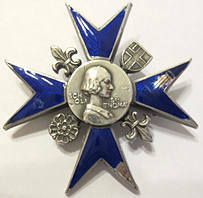 The badge was awarded to nurses who had completed three years training, passed the hospital exam and then worked for one year as a staff nurse, but more recently, the badge was presented on qualification. The condition of these two badges contrasts markedly; the older badge on the right is pristine and still has its own red box; perhaps it was rarely worn? Fig 3, the badge of Catherine Ethel McMinn Graham. Catherine remained in GNC indexes until at least 1931; further indexes were not searched forwards; she may also have been living in London from 1939 onwards, but as only one middle initial is used in the electoral role records it is difficult to prove. (3) Catherine appears to have died in Worthing in the June registration quarter of 1980, aged 82. By obtaining a copy of her will, if she left one, it may be possible to determine more about her family, and life. The second and battered Nightingale was owned by Mary Mildred Pickering and awarded to her in 1939, after three years training; which was shortened by one year due to the start of WW2 and shortage of nurses. Fig 4; Mary Pickering's badge. Her Nightingale records document her career; in April 1940, Mary completed her Part 1 Midwifery training at Birmingham Maternity Hospital, and in June 1942, she was appointed Ward Sister at Newton Abbot Hospital but later on in 1942, she is reported to be 'Undertaking Industrial Nursing'. In 1945 she 'Had a serious accident whilst cycling -leg amputated but hopes to return to work.' (9) Presumably because of the accident she worked from 1950-1952 as a 'Nurse secretary' and from 1952-4 as a 'Nurse secretary to a private doctor in Hove'. By 1955, Mary worked for eight months as part time relief sister at Ashbarton hospital, Devon, before retiring due to ill health in 1958. Mary's record is particularly full, and the last entry states; '1967- no further information'. (9) Mary appears to have died aged 85 in March 1991 in Southend-on-Sea. The third Nightingale, probably did not have a badge, as she trained in 1883. Family rumours suggested that Victoria Watson -Taylor, a great great great-aunt of mine had been a nurse. Censuses for 1901 and 1911 also supported this, but only said 'hospital nurse'; by 1911 she is also recorded as 'retired', which along with difficulties in tracing people with a double surname in censuses, meant that she proved elusive. It was only recently that I broke down this research 'brick wall'; and I found proof that Victoria had been a nurse. I found her name in a Burdett's' hospital Directory of nurses for 1899, and saw that she trained at St Thomas'. I was delighted to find another nurse among my ancestors; I have also recently found another, more distant relative, who trained at the London Hospital in Eva Luckes time, so was delighted to find one who trained at St Thomas' in Florence Nightingales lifetime. Victoria was born in 1860, the youngest of eleven children born to a wealthy family who lived in Erlestoke Park; a large country mansion once visited by Queen Victoria, the family's lifestyle dubiously financed by sugar plantations and the slave trade; the house is now a prison. I only have one picture of Victoria's sister Rose, my great great grandmother, despite the rumour that the family were painted by a society painter, so use a photograph of St Thomas' instead. Victoria moved to Harrow in the 1920's and lived in the Covent of the Visitation, dying and being buried there in 1939. All three women showed grit and mettle inspired by the founder of their nurse training school, Florence Nightingale. Catherine, followed to an extent in her father's footsteps by working abroad, Mary managed to return to work despite a major injury, at a time when prosthetic limbs were harsh and un-accommodating on the remaining stumps, and Victoria left a safe, upper middle class wealthy back ground, albeit with one sibling who had a well publicised acrimonious divorce, to work among the poor in London as a District Nurse. For those of us who have watched the BBC's 'Call the Midwife, and read about the research behind the programme, here is another conundrum; apart from the BBC's general inability to get the London hospital uniform correct! 'Chummy also known as Camilla Cholmeley-Browne ', the author Jennifer Worth's friend is meant to be a real person who trained at St Thomas' and received a Gold Prize; the programme researchers were unable to verify this story, possibly due to name changes and from memory I recall that they said that St Thomas's Hospital Training School had not awarded prizes. When searching among the St Thomas' records recently I found documentary evidence that St Thomas's Nightingale Training School did award Gold, Silver and Bronze medals to student nurses in 1939, based on their success in their exams. (12) Looking for Chummy among the records, would make it rather a 'fishing trip', because of her name change from real life to the book; and the medal prizes may have been stopped by the time ' Chummy' is supposed to be there. 2. The National Archives, General Nursing Council Register, DT10/67, Register 11. 3. TNA, DT10/10, GNC Indexes,1931. 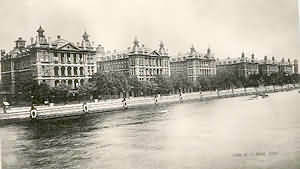 4. http://www.oocities.org/hotsprings/2615/medhist/hospital5.htm, accessed 26th December 2013. See http://www.schoolsofnursing.co.uk/Collections1/Collections18.htm, for information on paying probationers. Metropolitan Nursing Association in Burdetts. 7. www. Ancestry.co.uk, TNA, 1891 census, Class: RG12; Piece: 63; Folio: 57; Page: 39; GSU Roll: 6095173. 8. Burdett's' hospital directory of nurses 1898, The Royal London Hospital Museum and Archives. 9. L.M.A, H01/ST/NTS/C/04/025, pg 1925.
archives/Documents/visitor-information/36-history-of-nursing-at-lma, pg 10, accessed 27th December 2013.
http://www.districtnursing150.org.uk/history_william_rathbone.htm, accessed 27th December 2013.
midwifes-chummy-exist, accessed December 28th 2013. 13. TNA, GNC Index, DT10/31, 1941. 14. LMA, Roll of Probationer Nurses, CLC/010/MS1650/001, pg 59; LMA, Admissions Register Number 1, A/NFC/017/001, pg 49. 15. LMA, Nominal Roll of Nurses, CLC/010/MS14649,pg's 4, 49. 16. LMA, Nominal Roll of Nurses, CLC/010/MS14649,pg's 4, 49. 17. £30 was worth about £1,500 in 2005; LMA, Admissions Register Number 1, A/NFC/017/001, pg 49.